Surrealist knife designer Elijah Isham opened the door into the world of Slip Joints with the awesomely sized Blackstar. Featuring a solid G10 frame with Carbon Finer handle inlays and a lanyard loop for easy attachment of your favorite bead. 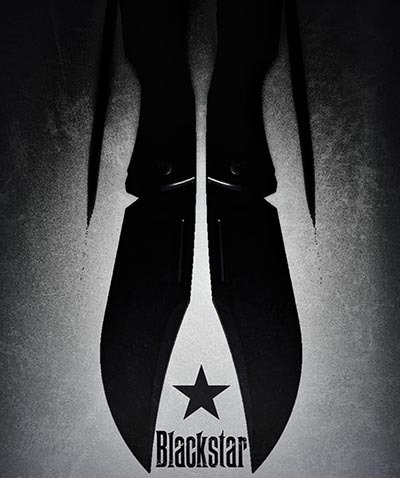 The Blackstar is a hyper modern take on a classic style of knife, a 3D milled pocket clip allows the knife to sit comfortably in your pocket while an exposed blade tang on doubles as a flipper tab. The detent mechanism allows the knife to operate nicely while being legal almost anywhere as there is no locking blade. PVK 18 Knife Custom Collector Bag Marfione Custom SOCOM Elite M/A Tanto Prototype Rat Worx MRX Chain Drive Auto Custom Black Lizard Skin Inlay PVK Custom Knife Case 14"